We can help you find a vacation condo that fits your needs. These three are a sample of the condos we have available for rent. Sleeps 6, 2 bedrooms, 2 bathrooms. No pets allowed. Reserve this condo or similar condos. 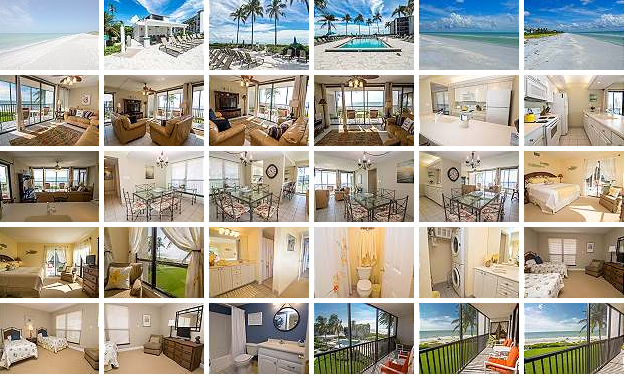 This highly sought after Beach Front condo offers breathtaking views of the Gulf of Mexico from just about every room. Sundial A-301 offers 2 bedrooms, 2 bathrooms, fully equipped kitchen, washer, dryer and is nicely decorated. Sundial is a tropical resort located on Middle Gulf Drive on Sanibel Island. The complex offers use of 4 pools, gas BBQ Grills, access to the Tiki Bar located by the main resort pool, Bailey’s Market Place, Pizza and Ice cream Parlor. All you need for a wonderful beach vacation awaits you here at Sundial A-301. Call now to secure your time in this lovely property. This condo requires a 7 night minimum. Sleeps 4, 1 bedroom, 1 bathroom. No pets allowed. Sundial J-401 offers 1 bedroom, 1 bathroom, fully equipped kitchen and is nicely decorated. Sundial is a tropical resort located on Middle Gulf Drive on Sanibel Island. The complex offers use of 4 pools, gas BBQ Grills, access to the Tiki Bar located by the main resort pool, Bailey’s Market Place, Pizza and Ice cream Parlor. All you need for a wonderful beach vacation awaits you here at Sundial J-401. Call now to secure your time in this lovely property. This condo requires a 7 night minimum.